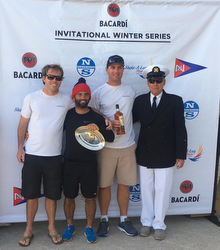 (Coconut Grove, FL)- The 2019 Bacardi Invitational Winter Series continued with the second event of the 3-stage inaugural series on January 19-20 in Miami, FL. With two-dozen J/70 teams from the USA, Monaco, Germany, and Great Britain on the line, Biscayne Bay delivered two distinctly different days for the competition. Three races were completed for the J/70s on day one in 10-12 knots and sunny skies. However, the remnants of Winter Storm Harper proved disruptive for day two. Once the system passed, a cloudy and colder WSW breeze at 15-18 knots allowed for two more races. Starting off with a mid-fleet finish in the first race, Joel Ronning’s CATAPULT team of Patrick Wilson, Victor Diaz De Leon, and Chris Stocke set a blistering hot pace for the remaining four races, peeling off a 4-1-1-2 to win with just 8 pts net. For this team, that is two wins in two weekends of racing J/70s, first Tampa Bay, then Biscayne Bay! Yet another J/70 World Champion was chasing the CATAPULT team hard and keeping Ronning’s crew honest; that would be Peter Duncan’s World Championship caliber crew on RELATIVE OBSCURITY (Willem van Waay, Bill Hardesty, and Will Felder) that posted a very steady performance, collecting a 2-6-4-3-4 for 13 pts net to take the silver. Taking the bronze with a record of 1-1-8-4-10 for 14 pts net was Bruce Golison’s MIDLIFE CRISIS with crew of Jeff Reynolds, Steve Hunt, and Erik Shampain. Rounding out the top five was an international affair. Taking fourth place was Germany’s Harm Müller-Spreer, skippering a “baby” PLATOON. Harm normally sails his World Champion TP 52 of the same name with an awesome “metal plating-look” paint job. His crew of Eric Doyle, John Kostecki, and Doug McLean managed a 4-9-2-5-5 for 16 pts net in their first event as a team. 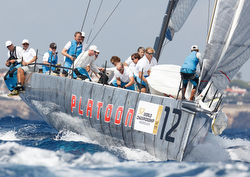 In fifth was another talented crew from Monte Carlo, Monaco; Giangiacomo Serena di Lapigio’s G-SPOTTINO. His team of Alessandro Franci, Ettore Botticini, and Luca Faravelli posted a 9-2-5-7-12 for 23 pts net. For more Bacardi J/70 Winter Series Act II sailing information Add to Flipboard Magazine.